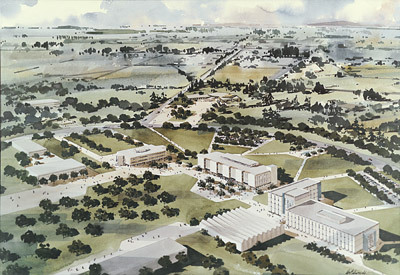 Image: Watercolour conception of the University of Victoria rendered for Robert W. Siddall by artist Allan W. Edwards. Includes caption: "a beautifully landscaped quadrangle, 300 ft. by 900 ft., will be the centre of the campus, forming a park-like setting, free of vehicles for the main buildings," ca. 1962. Source: George N.Y. Simpson photo of watercolour, UVic Archives 47.101.